Whenever we want to relish some good north indian dishes, we directly head into KKR Restaurant located in Padur, Chennai. I came to know about this restaurant when I searched in Askme for restaurant listing near Kelambakkam. We prefer Hotel Krishna Bhavan in Kelambakkam for authentic Tamil Nadu dishes like idli, dosa, paratha and so on. 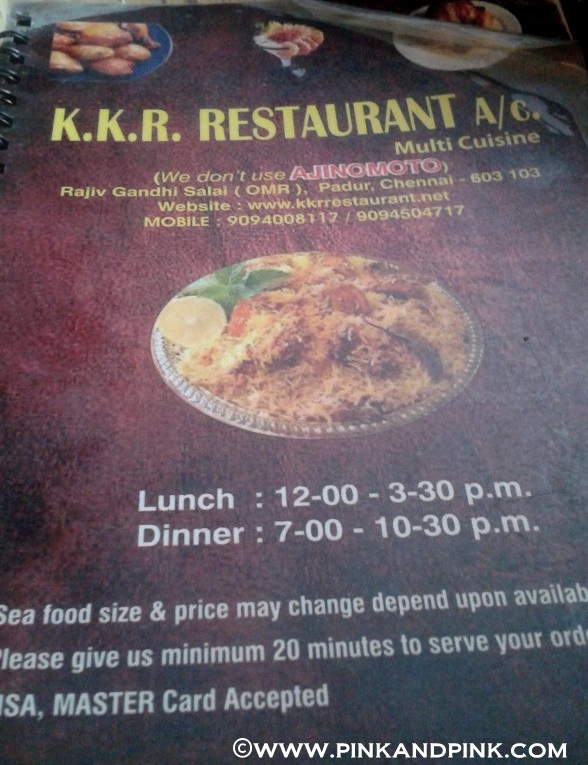 But when it comes to north indian dishes, we choose KKR Restaurant. It is quite a decent restaurant where we can go with our family and spend sometime while tasting their dishes. 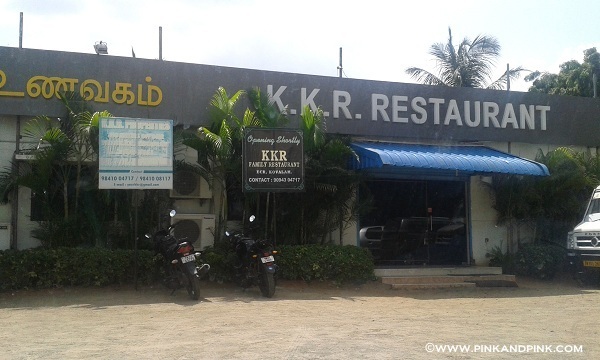 KKR Restaurant is located in Padur, right on the OMR in Chennai. It is one of the best hotels located in OMR. It is a multi cuisine restaurant. It is located close to Siruseri and Jeppiar Engineering college. They have good North Indian, Tandoori, Chettinad, Chinese Veg and Non Veg dishes. You need to wait for sometime after you order. If you are in a rush, it is better to check with them which dishes can be delivered fast before ordering. Sunday afternoon is really a crowded time. You need to wait to get a table itself mostly. My hubby always tells me that it is good to wait patiently after we order as there is high probability that we might get freshly cooked food. Waiting time is not a problem as we go to restaurants to spend sometime outside with family. Even we have to wait a lot in my another favorite restaurant Sachin Ka Dhaba located in Thoraipakkam, OMR. 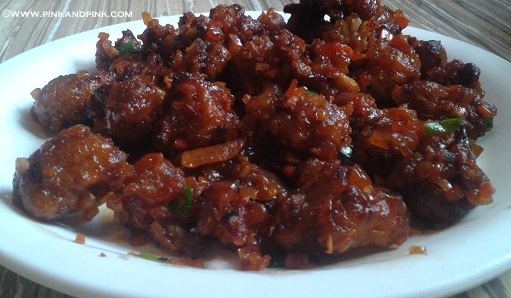 So, whenever we go to KKR, we first order my favorite Gobi Manchurian and ask them to bring first. Then only we start looking out for other dishes. You can check their menu card with price here. According to me, price is neither expensive nor cheap. It is moderate. As per their menu card, they do not use AJINOMOTO, I really appreciate that. My favorite dishes in their restaurant are Gobi manchurian, Matar Paneer Masala, Paneer Butter Masala, Green Peas Masala, Butter Naan and Dal Tadka. Sometimes, I can see more oil floating on the top of the gravies. Sometimes they don't:) But the taste is good most of the times. Once we ordered Paneer Pasanda and it was not so good at that time. After that we never tried it again. We had ordered Gobi Manchurian, Baby Corn Manchurian, Roti, Garlic Naan, Matar Paneer and Dal Tadka last time. Roti and Baby Corn Manchurian were not that much great. Roti and baby corn used in the manchurian were little bit dry. 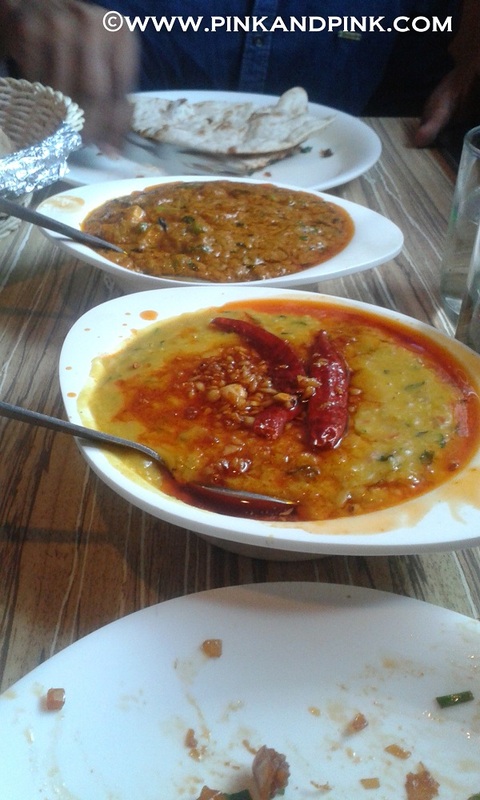 Dal Tadka and Matar Paneer had generous amount of oil floating on the top. This was the first time I had seen so much oil in their food. Before that, the amount of oil used was moderate only. But the taste were so good. Quantity is more than normal quantity you get in most of the restaurants. If we order two gravies for two of us, we end up in packing half of the gravies and have it for dinner also at home. We do not order one as we like to taste two different gravies each time. Bread basket is really good. We will get 5-6(I forget the exact no) different rotis/naans in the basket. Again we end up in packing them if we order for 2. KKR Restaurant is a good multi cuisine restaurant located in Padur. It is located exactly on OMR, Chennai. This is one of the restaurants to which we drive frequently. I would recommend you to try their food once. You might like it.